You can’t organise the circles. You can’t reorder them, prioritise them, nest them, describe them, colour code them. They are impractical. My friends within circles are only displayed as tiny circular icons, and even then I can only see thirteen. To do anything useful with these contacts, I have to bring them up into a grid view. This grid view is the real interface. 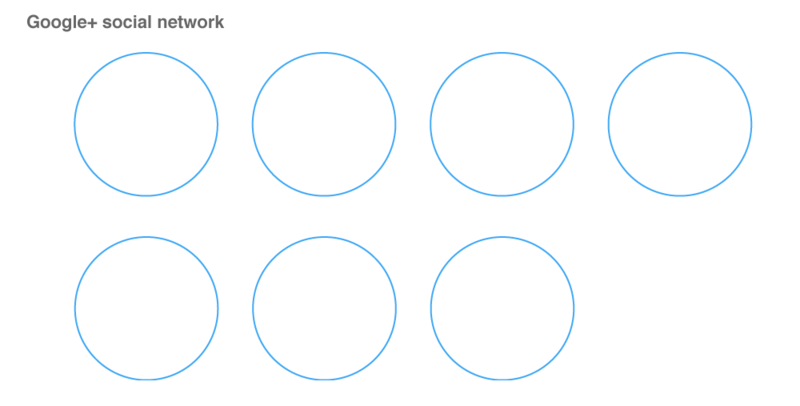 The circles are purely a novelty UI – a marketing gimmick. 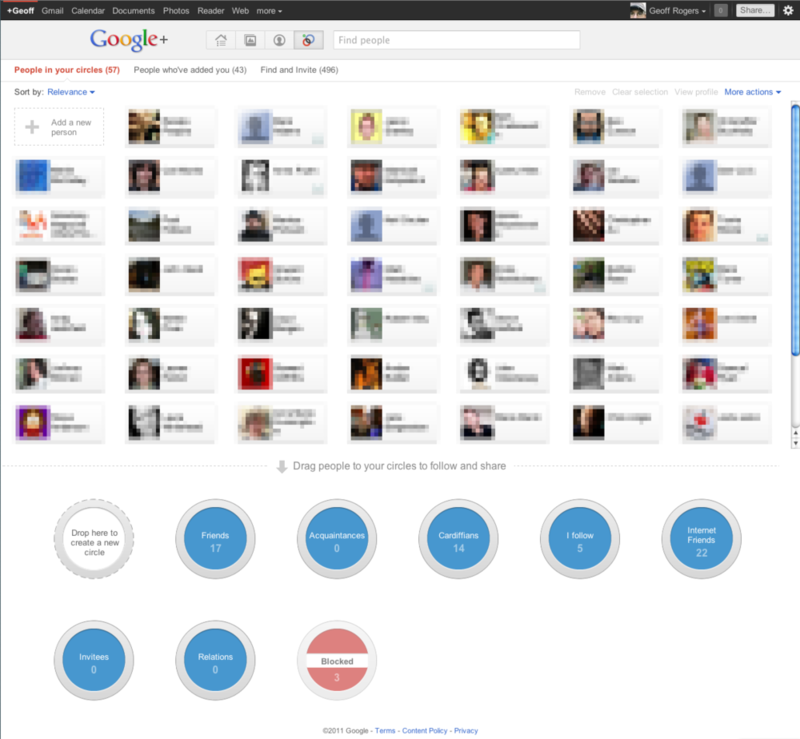 They are simply styled lists that make the process of organising your G+ contacts prettier, but more difficult. Our real social networks are complicated. Our contacts overlap. They are important to different degrees and for different reasons. Many are not friends at all. We may not want a ‘close’ family member to have our telephone number, for example, but we may want a complete stranger at an online retail store to have it. Buckets! As many as you like. Original rotary telephone picture by postbear on Flickr. 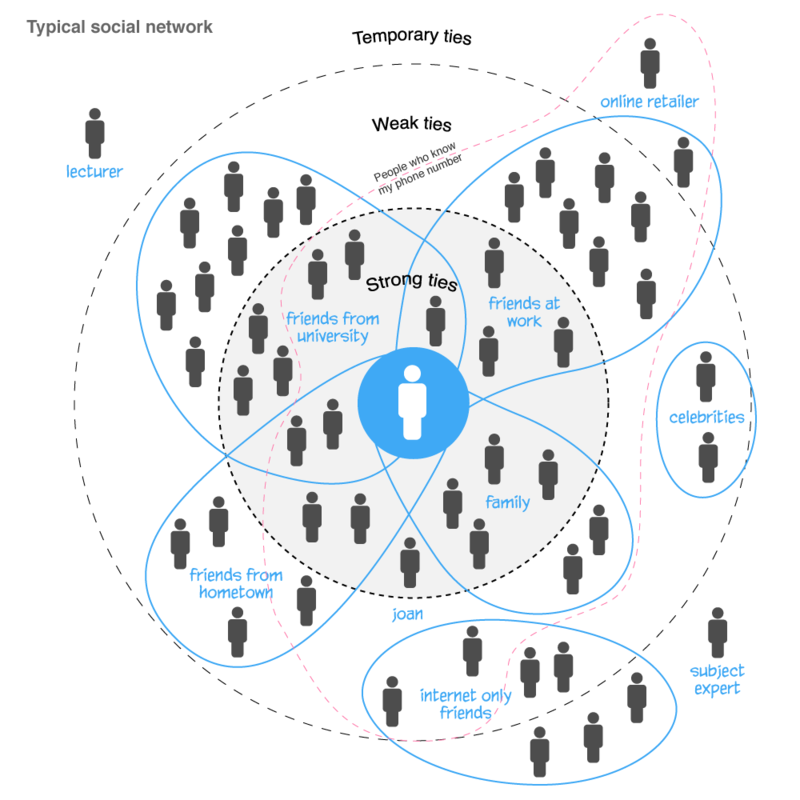 Big social diagram was basically copied from the slides of Paul Adam’s talk ‘The Real Life Social Network’. This entry was posted in Interestingness and tagged Google by Geoff. Bookmark the permalink. I’m not sure your final diagram is entirely fair, you can, after all, put one contact into more than one circle, so the ‘buckets’ may at least overlap.Also the criticism that ‘our real social networks are complicated’ could almost be a compliment. It’s true that Google+ falls down here, but it has still come the closest of any online social network I’ve seen to accurately modelling real-life relationships (in other words, none of the others really make a feature out of categorising your contacts at all).However, I share your bemusement about quite what the fuss is all about. I have the feeling that circles could be really useful, but I don’t have enough friends on the service (yet?) to really figure out what for, and it does seem they are missing the point by only allowing you to funnel what goes out, and not what comes in.I kind of suspect Google+ will never really take off, but then I suppose in the end all this personal information is worth enough to Google for them to keep riffing on this theme (Buzz, Wave, now G+…) with this stuff without any apparent shame at their continued failure. Buckets can overlap, but the burden is on you to create and maintain lots of buckets if you want to get pretty granular. You’ll be slowed down again when you want to post, and have to make sure that you’re broadcasting to the right people. None of this is _difficult_, but I can see it getting tiresome. Being able to group circles would help, at the expense of making things even more complicated.I’m rooting for G+. I’d like a social network that lets you do more than Twitter, and I really can’t bring myself to use Facebook. Google certainly seem to have learned lessons from Buzz and Wave. I think the real benefit of Google+ circles is that it puts privacy settings right under the nose of its users, it’s trying to make it part of the ‘fun’ of social networking.Technically, I suppose you could do the same thing with Facebook’s lists, ie. control which group of friends see which posts, but most people don’t do that, probably because of the horrendous UI or because they don’t know anything about the feature.I agree, Circles could still do with some work but I do applaud Google for making a feature out of it and for attempting to making it feel, at least at first, easy (maybe even fun) for the average person to do.Whether or not it will mean that Google+ fails or succeeds with the general public, I don’t know, but it’s certainly interesting from a my geek perspective. I think that’s the nub of it Steve. Perhaps they should have simplified things even more by giving users just a few default circles (maybe based on the weak link / strong link model above). It seems to me that they either need to be more useful (ie. more complicated), or simpler so they will be more widely used and understood.It seems they are going the more complicated route.